Luxus Appartement, lokalisiert in Puerto Alto, eine hohe Qualität Wohnanlage mit Schöne Gartens, 2 Schwimmbäder. Der Hafen, der Strand und das Zentrum sind zu Fuß erreichbar. Kinderbett ist vorhanden: € 25, - pro Woche. Kinderhochstuhl ist vorhanden: €. 15, - pro Woche Tiefgaragenplatz; €. 35, - pro Woche + €. 50, - rückzahlbare Kaution für die Fernbedienung Strandtücher €. 8, = pro Handtuch pro Aufenthalt. * Unsere Gäste erhalten bei der Ankunft einen Begrüßungskorb mit Wein, Wasser und Kaffee. Seifen und Toilettenpapier sind für die ersten Bedürfnisse vorgesehen. 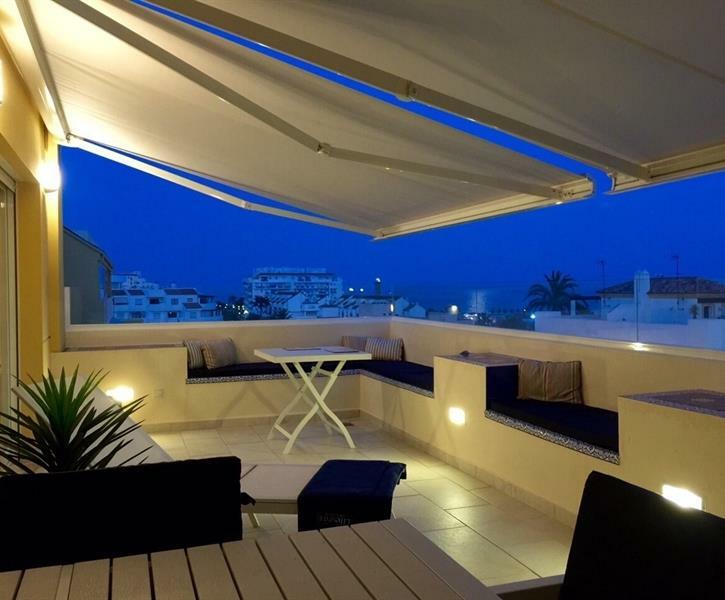 We have recently returned from 3-weeks in Estepona, staying in this beautiful apartment. The booking of the apartment and the communications with Ineke before arrival were really excellent and when we arrived very late on a Sunday and received a lovely warm welcome. The apartment itself was immaculate, 3 excellent sized bedrooms and a very spacious dining area and lounge with a very well appointed kitchen. The terrace faced the sea with a good view to the Marina with sun most of the day - a great place for breakfast! The pool is a short walk from the front door with loads of sunbeds. It did not get too crowded at any time, even in August. The air conditioning was excellent (important for us Brits) and the wifi fast (important for the teenagers). The Marina was a short walk with load of restaurants and a 5-10 minute walk from both beaches. Absolutely nothing to fault with this apartment, and it comes highly recommended. We have just returned after staying in this excellent apartment for 11 nights. The apartment was 1st class, spacious and spotlessly clean. The location was excellent and the sun terrace for me was unbeatable, getting the sun for most of the day. We have been going to Estepona for about 12 years now and this apartment is the best we've stayed in for pure quality. The booking of the apartment and dealing with Ineke was a pleasure. I will be contacting Ineke in the next few days to inquire about this apartment for next year. So yes i would definitely recommend this apartment. We immediately fell in love with the condo at Puerto Alto as soon as we arrived. We were a group of 4 adults (seniors) from Canada who wanted a home base to go back to at night while traveling around the region. From here we drove to Seville, Granada, Gibraltar and Rhonda with a rest day in between each to enjoy Estepona itself. Marbella is a short distance which we visited a few times. The apartment was perfect for us, having 3 bedrooms, 2 separate washrooms with a shower in each, and a well appointed kitchen with all your needs. The place was beautiful, as were the grounds. All was very well kept. We were able to park our rental car right outside the building. There are 2 grocery stores within a five minute walk as well as plentiful restaurants at the marina, and a great cafe to sit outside and have the best coffee. There is a beach where you can rent lounge chairs and an umbrella...all within walking distance. We loved the market on Sundays at the marina to purchase all of our souvenirs. Thank you for letting us stay at Casa Ballering. We will always remember the view from the covered patio overlooking the sea and the gorgeous sunrise we had in the mornings. Our two-week stay in this lovely apartment, as a family with two small children, could not have been any better. The apartment is exactly as the description sets out - simply amazing – and it has everything: spacious, fully and well-equipped with top-end appliances, beautiful décor, great location (you have everything within walking distance: supermarket across the street, marina 5 min walk where there are numerous bars and restaurants as well as various beach options) and not to mention the great terrace with a beautiful view. The complex also has two great pools and the surroundings of the complex are well maintained and clean. We also truly appreciated the amazing welcome we received upon arrival / departure. Without a doubt, we will return whenever possible.